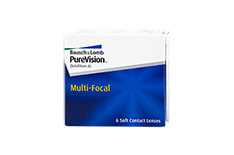 PureVision monthly lenses are the next generation of contact lenses from Bausch & Lomb. In the 1950s Bausch & Lomb released the classic Ray-Ban Wayfarer sunglasses and revolutionised the sunglasses market. 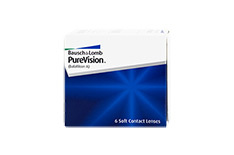 Fifty years later Bausch & Lomb is launching the PureVision family of contact lenses once again making a quantum leap into the future. The PureVision family is the first range of monthly lenses that has such high oxygen permeability levels and such low water content that they can be worn around the clock: for days and 30 nights nonstop. The specially developed silicone hydrogel balafilcon A is what makes this possible. It provides high oxygen transmissibility without the need for a high water content, which has the side effect of drying the eyes out. Furthermore, the material has a stable form, meaning that the lenses sit securely on the eye and provide great comfort for the wearer around the clock. PureVision Spheric is a monthly lens that combines excellent materials and a light aspheric design, which equip the wearer with highly defined contrast and sharpness - even at dawn and in poor light conditions. The PureVision monthly range from Mister Spex also includes PureVision Toric for astigmatic eyes. 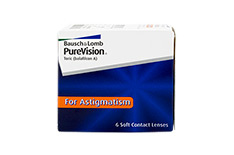 Now people with astigmatism can also enjoy the freedom of nonstop extended wear. What's more, Mister Spex offers monthly contact lenses for people with presbyopia. 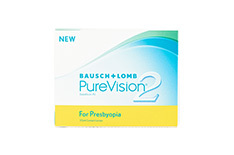 PureVision Multi-focal lenses correct presbyopia and short or long-sightedness with PureVision's proven know-how. Multi-focal contact lenses replace varifocal glasses and bring the added benefit of pin-sharp vision across the whole field of vision. Mister Spex would like to point out that you should only wear lenses for the number of days indicated on the box. You should wear contact lenses after consultation from an eye doctor or optician, as, despite the very best quality of the materials used in the lenses, some types of eyes require that every now and then the lenses be cleaned with all-in-one solution or protein remover. PureVision products can be bought from Mister Spex at unbeatable prices, and all purchases come with our right of return. Discover how much you can save in the Mister Spex online store with our unique bundle offers.